For a while it seemed that all anyone was talking about for the "Han Solo Standalone Film" was the movie's troubled production. From problems with the lead actor, to switching directors well into production, to the fact that Disney ended up re-shooting over 90 percent of the film, it seemed that the film was going to be a huge disaster. Now that Solo: A Star Wars Story has come out, I can say without hyperbole that it was the most fun I had watching a Star Wars movie since watching the original trilogy at six years old! 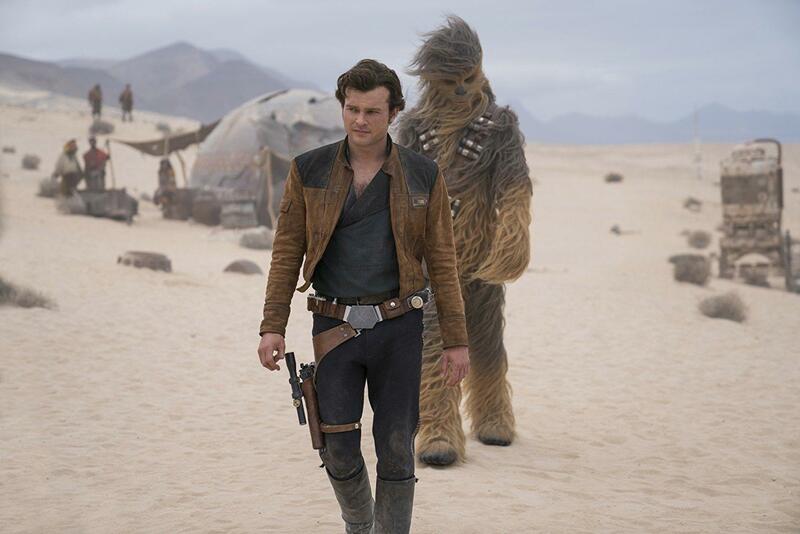 As advertised, the film follows the life of a young Han Solo (Alden Ehrenreich) as he escapes from his impoverished planet, gets involved in the smuggling life, befriends Chewbacca, meets his friend/rival Lando Calrissian (a scene-stealing Donald Glover) and together they pull off an elaborate heist for a galactic crime lord. It's a simple story and that's exactly what it needs to be. Director Ron Howard seems to understand what Star Wars has always been at heart: a Flash Gordon serial crossed with a Western; and with it's poker games, train robberies and showdowns at high noon, this is every bit a Western. Also, there's finally a nice dash of romance in this one which is a relief since Disney has been turning the series frustratingly chaste as of late.